What does Pinky Street, Ernie of Sesame Street and a hot pink make-up brush have in common? They all travel. Not by themselves, of course. 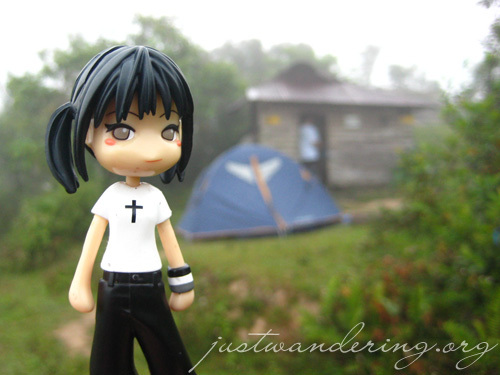 I’ve long since learned to ignore the strange glances I get when I take out my Pinky Street dolls to take photos. 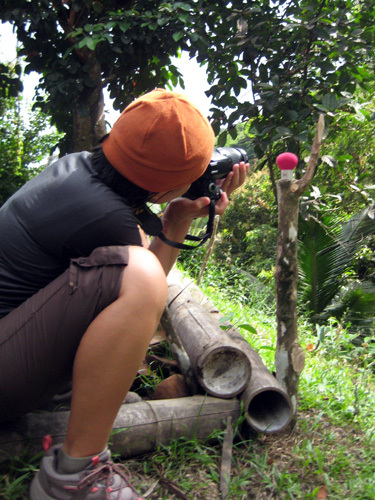 So when I got to travel with two other people with travel gnomes, I was happy because I wasn’t so freaky afterall; other people take photos of inanimate objects when they travel, too! Phoebe, being a beauty blogger for SwipeSomeGloss.com, has her hot pink make up brush. 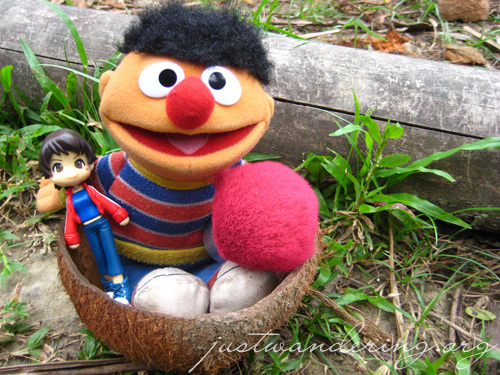 AJ of BaklaAko.com has his Ernie. All photos taken in Batangas, where we hiked up Mt Daguldol and beach bummed in San Juan decked out in Columbia Sportswear. I agree! 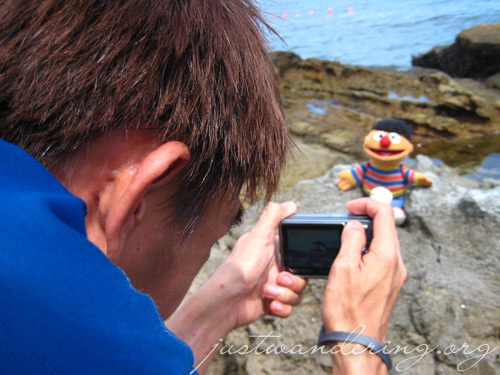 It’s so much fun to travel with people who have their own travel gnomes because they understand that need to take your toy out and start snapping photos! I had so much fun hiking with you guys! Looking forward to traveling with you again! Hike another mountain? Definitely! AHAHAHAHAHAHAHAHA. Uhm, pass? Let me think hard about this one… I’m still so sore even after a trip to the spa. I wanna climb another mountain! But only if (you know what I mean?) lolz. Was it 5 hours? It didn’t feel like it was! I want my Travel Gnome too!! Hahaha. Awwww. They look like one not-so-big but happy family! Saya nyo ah! Baklang AJ: True, it didn’t feel like 5 hours.. it felt like 10 I swear, that climb was torture. But I have to admit, it was fun in its own perverted way. Ferdz: Hurhur, it’s time to visit the toy store! Meron sa Toy Kingdom and Toys R Us nung maliit na animal plush toys. Php49 lang for a pair. I’m not sure if there’s a wolf, but they have pandas! Ernie is the cone head who has a rubber ducky which makes his bath time lots of fun. WADAPAK. First, the cone head doesn’t like rubber duckies! But yes, Ernie likes rubber duckies…. because he’s not the conehead!! !